I haven’t heard much about “BoJack Horseman”. None of my friends watched it or recommended it to me and the only way I really found out about it was through Netflix and Twitter. I gave it a shot a few weeks ago and just finished it. It. Was. Excellent. “BoJack Horsman” is a Netflix original animated show created by Raphael Bobs Waksberg and starring Will Arnett, Amy Sedaris, Aaron Paul, and Alison Brie. Patton Oswalt, Kim Jeong, Chris Parnell, and Stephen Colbert are a few of the many who have lend their voice to this outrageous hilarious and still poignant show. 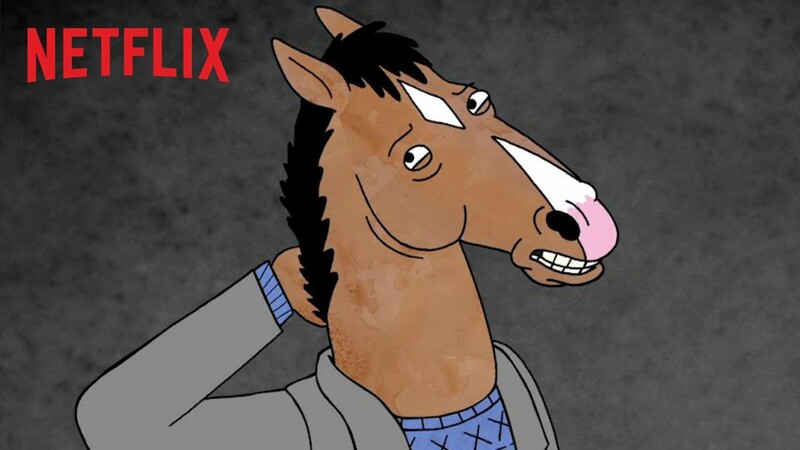 “BoJack Horseman” tells the story of Bojack who is voiced by Will Arnett as his struggles with the Hollywood life after starring in his hit television show, Horsing Around., while also utilizing Diane, voiced by Allison Brie, who is a ghost writer, writing BoJack’s memoirs. Now, just a quick note, animals, within this universe, can speak, they wear human clothing, and they often walk upright. It is an animated show, after all. Despite getting over the initial hump of how weird this universe is, the show is hilarious. While containing a continuous and linear story line, the show doesn’t balk at makings quips about what it means to live in Hollywood, or any big city now a days. For instance, in one episode, BoJack and Todd, voiced by Aaron Paul who is BoJack’s parasitic like roommate go to a story in which they can pay hundreds of thousands of dollars to by wooden materials that appear to have been dragged in from the street. In another episode, BoJack’s on screen daughter, Sarah Lynn, voiced by Kristen Schaal, depicts the struggles of growing up as a female child star in an increasingly sexualized Hollywood in the appropriately titled episode Prickly Muffin. In another episode Todd must court two rival gang members in a scene reminiscent of Mrs. Doubtfire. The amount of pop culture references within this show, from Orange is the New Black, to Beast Buy, are just fantastic and kept me tuned in because I was afraid I was going to miss them. The show takes itself seriously without taking itself too seriously. There are often quick cuts and scenes in which the animals actually act like animals. There is also a drug-trip scene that is equally hilarious and horrifying. The show recently got renewed for a second season and I expect many people will begin talking and raving about it because of how good and funny it is. Have you watched “BoJack Horseman”? If so, what did you think? And if you haven’t. Check it out! I appreciate the post. I will tell you though, that I hated this show. I watched the first two episodes and laughed out loud at a single line. Will Arnett has a great voice for animation but personally I don’t think he’s been able to find the right role. The Nut Job is the maybe the worst but as mentioned, I didn’t like Bojack either. But again, thanks for the thoughts.